You will need 20 bamboo skewers soaked in cold water for this recipe. Use a long sharp knife to slice pork meat into thin and long slices - 1/4 inches thick and less than 2 inches wide. 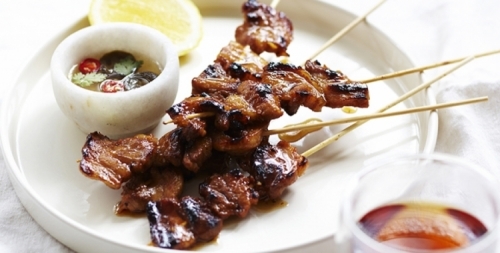 Reserve some of the marinade for a dip, bring it to the boil and serve it with the skewers. Do not use the marinade before cooking as this will make you sick. Combine the pork, soy sauce, garlic, onion, calamansi juice, lemonade, pepper, sugar and catsup in a large bowl. Preheat a barbecue grill on medium-high. Thread pork evenly among skewers. Add to barbecue and cook, turning occasionally, brushing with extra marinade, for 5-7 minutes or until pork caramelises and is cooked through. Transfer to serving platter.